You can control and view up to 64 IP camera feeds simultaneously. Get a live preview from multiple cameras with this light-weight application. 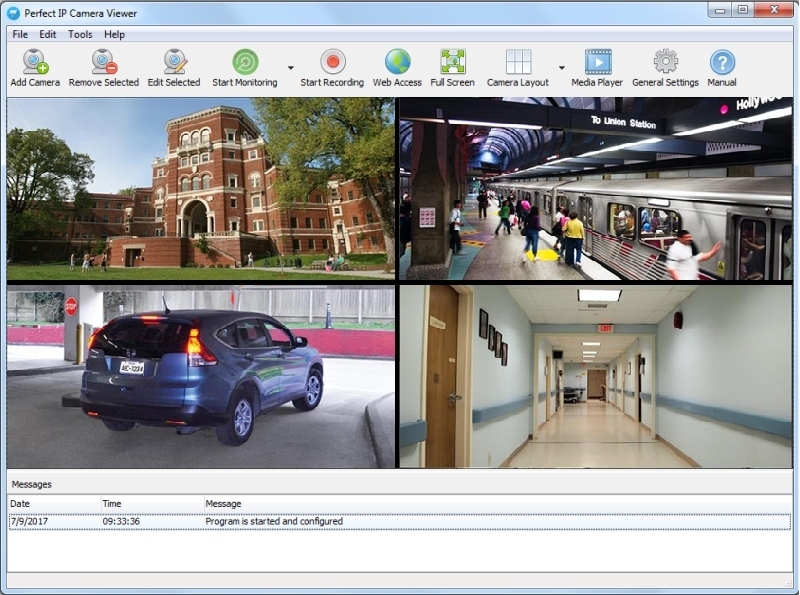 IP Camera Viewer's centralized camera and layout management allows you to view your cameras from multiple remote locations on a single screen. You can change the arrangement and preview layout of the cameras, for your security needs. If you have internet, you can quickly review what is going on in real-time. Check it on your phone, in your browser, or on computer. Currently more than 2000 different IP camera models from leading camera manufactures are supported. The motion detection algorithm makes IP Camera Viewer to react only if needed. Using the sensitivity configuration tools, you can adjust the level of motion sensor, or exclude any areas from monitoring. Know what is going on in monitored area during the scheduled periods directly on your phone by getting SMS and email notifications. Getting information on time allows you to take appropriate measures if something unsual is going on. This software is perfect for: - Home Security; - Office Surveillance; - Work Monitoring; - Nanny Cams; - Pet Monitoring; - Neighborhood Watch; - Staff Monitoring; - Machinery Monitoring; Our surveillance software puts the power of security in your hands. Whether you're using it to monitor your home or to manage security for a large corporation, this powerful system provides priceless peace of mind. The Perfect IP Camera Viewer can be freely distributed over the internet in an unchanged form. Perfect Surveillance Software licenses the accompanying software to you only upon the condition that you accept all of the terms contained in this license agreement. Please read the terms carefully before continuing installation, as pressing the 'I accept the agreement' radio button will indicate your assent to them.